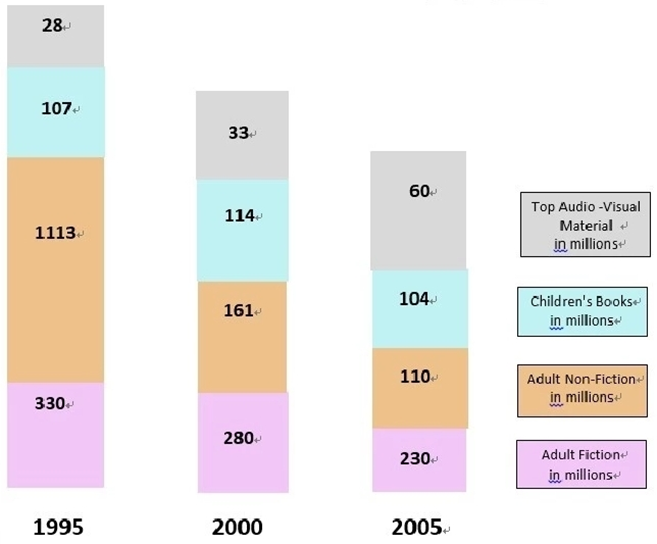 [作文题目] The chart below gives information about library borrowing in UK public libraries during a 10-year period from 1995 to 2005. [作文题目]Some people think that as the part of education, students should spend a period of time living in another country to learn its language and culture. To what extent do you agree or disagree? Living in a foreign nation is always advantageous to experience a different culture, even for a short period of time. One day abroad is one day learnt. Hence, students living abroad usually have better and more thorough understanding of the outside world than those students who do not have these experiences; they also tend to have more open minds to differences in culture and so become more tolerant to other groups of people. Compared to those who learn the cultural values of foreign coun-tries from books and media, students who have overseas living experience can have a broader per-spective of the world we live in. Also, having first-hand exposure to the local language is the best way to learn it. The truth is that no matter how much students excel in foreign language courses, they do not usually master the lan-guage completely. For example, there are never enough English native speakers in schools to pro-vide a real English-speaking community, which may result in students knowing English very well in terms of grammar or reading, but speaking and dialogue comprehension is a big obstacle for them. In contrast, living in the foreign environment gradually improves the learning and accent in speaking and allows them to learn collocations that native speakers normally use in daily conversations. In conclusion, I firmly hold the view that living in another country for education purposes is advanta-geous both culture-wise and language-wise.